Would you like to do something special or different while on vacation? Disney offers events specifically for children. It's a great way to escape the hustle and bustle of the parks. Several resort hotels host "adventure cruises" for kids aged 4-12. These two hour adventures allow kids to explore the waters surrounding the resort and hunt for buried treasure. Pirate "guides" tell stories and lead the group on a fun high seas adventure. The following adventures cruises are available. During the Albatross Treasure Cruise kids travel the waters of Crescent Lake and the Epcot World Showcase Lagoon in search of buried treasure. The Cruise offers Guests an interactive adventure and featuring six different ports of call, including stops to the Japan and Germany pavilions in World Showcase. The cruise sets sail from Bayside Marina, located behind Disney's Yacht & Beach Club Resort. Children wear pirate bandanas and follow clues to search Bay Lake and the Seven Seas Lagoon for buried treasure. Two cast members, including a lifeguard, accompany the group. They will sail along the Resort Marinas to collect treasure. At the final port, children will have a snack and split up the treasure. Children must be potty trained and ages 4-12. Must cancel 24 hours in advance or pay full price. Schedule: Monday, Wednesday, Thursday & Saturday at 9:30. This is a 2 hour adventure. Available to all guests. Space is limited. Schedule: Sundays & Tuesdays at 9:30. Available to pirates ages 4-12. Children must be potty-trained to participate. Space is limited. Children travel and explore the Sassagoula River to learn the pirate's way of life. 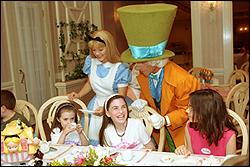 Disney Characters from Wonderland invite kids 4 to 12 years of age for an hour of games, stories and cupcakes. To sip on, kids are given a special “tea” that tastes remarkably like apple juice. The pint-sized partygoers also get to decorate cupcakes with sprinkles and more, make a craft to take home with them and have their photos taken with their very merry hosts. Your little princesses will receive the royal treatment with tea for two, princess cakes, and a meet-and-greet with Princess Aurora. The tea party is hosted by "Rose Petal," a magical rose from Aurora's garden. She leads guests in sing-alongs, storytelling and a special Princess parade. Encouraged to dress as their favorite Disney Princess, young royals sip apple juice "tea" and feast on fruit, an assortment of sandwiches—some heart-cut—and Princess Cake. Children must be accompanied by an adult, and the price reflects the individual cost per Guest for both one child and one adult. Reservations: Required and can be made by calling 407-WDW-MYTEA or online in the dining portal. Must be paid for IN FULL a time of booking. Price: Varies based on package chosen. See package descriptions below. Reservations: Highly recommended and may be made 180 days in advance by calling 407-WDW-STYLE. A credit card is required at time of booking. A $10 cancellation fee will be assesed for cancellations within 24 hours of appointment. Good to know info: Children must be accompanied by an adult 18 or over. Valid park admission is required for Magic Kingdom location. Makeovers take approximately 30 minutes. Click here for more information about the Bibbidi Bobbidi Boutiuqe, including packages and pricing.